Clean away annoying carpet stains, lift away in-ground daily dirt and help manage allergy symptoms for a healthier home. Give your sofa a new lease of life or revive an old favourite with a deep down freshening and caring clean. We promise you a 100% satisfaction guarantee on your clean for carpets, rugs, fabric and leather upholstery, curtains and mattresses in Southampton, Basingstoke, Portsmouth, Winchester, Eastleigh, Fareham, Gosport, Romsey, Havant and New Forest. To get started we need to give you a quote. Quotes are free and you're under no obligation. We can give indicative costs over the phone, but it's best to organise a free home visit so we can discuss the most appropriate cleaning approach and give an accurate fixed cost. We promise you a 100% satisfaction guarantee on your clean. Find out how we do this below. We are punctual and polite, considerate and respectful. You can confidently leave us to do a great job so you're free to get on. Most carpets dry within 2-4 hours and upholstery within 1 hour, so there's no-fuss and you can quickly get back to to normal. If you've never tried it before, you are in for a treat. We'd love for you to experience the same delight that many of our customers have when they see just how good their carpets, rugs, sofas, leather suites, mattresses and fabric upholstery look and feel after our professional clean. So if your carpets and rugs are dirty and stained, if your sofa or upholstery is grimy and soiled or if there's an embarrassing musty wiff in the air, you need not put up with it. We've got the expertise and TLC to leave them looking, smelling and feeling super fresh and clean. help guard against stains between cleans and prolong the life of your carpets and upholstery. 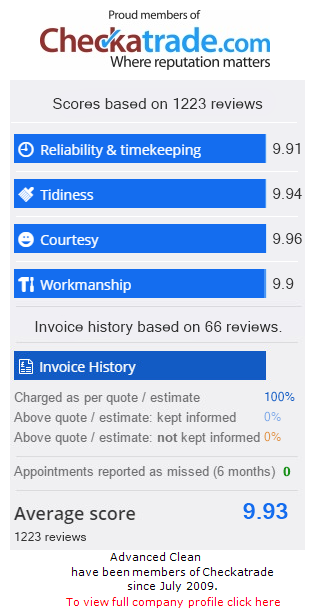 Our customers have confidence leaving their carpets and soft furnishings in our hands not just because they trust our 12 years experience and fine-tuned expertise, but because of our excellent Checkatrade reputation and what our past customers say. So if you live in Southampton, Basingstoke, Portsmouth, Winchester, Eastleigh, Fareham, Gosport, Romsey, Havant or New Forest., we'd love to hear from you to give you your free no obligation professional cleaning quotation today. Carpet and 2 sofas cleaned. Really great job cleaning our lounge carpet and 2 sofas. Did the work in the amount of time estimated, and turned up when they said they would. Returned my voice mail quickly when I rang for a quote, and very polite. Will definitely use again.